The roof of your Scottsdale home is one of the most important structures in your home, but is also the most susceptible to the most amount of damage. The large surface area of your roof offers a lot of open space for exposure to natural phenomenon that can be potentially damaging. Living in Arizona offers a wide array of nature related activity that could threaten to damage your roof. There are steps you can take to protect the integrity of your roof from a few common threats to your roof. Besides kicking up the dust in the desert, wind can bring with it damaging effects on your roof. Winds can rip off or damage shingles, metal, rubber, tiles, and other roofing materials. During monsoon season, we can see some pretty big gusts that could do some serious damage, especially if roof maintenance has fallen the the wayside. Missing or broken tiles and/or shingles leaves your roof exposed, and can create an environment ready for water damage and even a leaking roof. Trees are kind of a gimme for causing roofing problems, especially following a large storm. Branches can be torn off during high winds and turn into projectiles, that can sometimes seem to target your roof. Falling trees are also a concern, especially during high winds, and even during re-landscaping. Being careful to take every precaution when trimming back trees, and/or cutting down trees is of utmost importance. You don’t want to take a chance that you’ll have a big Scottsdale roof repair needed during monsoon season because the trees up against your house get blown over in the wind. Keep your trees trimmed and cut back, and a safe distance from your house. Trees shed leaves, palms, and branches. You don’t want those to accumulate on the roof, either. Besides adding weight, having organic materials rotting up against your roofing material. Deteriorating organic materials could also cause deterioration and mold to build up and create rotting spots in your roof. Make sure to clean debris off your roof, and avoid a premature re-roofing later on. Have you ever been pelted by hail before? It’s definitely not a pleasant experience. Just like it can bruise you, it can cause damage to your roof. However, hail is sometimes hard to see to the untrained eye. Sometimes it can hail and the homeowner is none the wiser that it has done so. Hail can puncture your roof or break tiles if it gets large enough and/or hits your roof hard enough. Be sure to check after storms to see that your roof is intact. If you have questions or believe that there may be some storm damage, having a professional roofer near Scottsdale come out and inspect could save you from a spendy roof repair later on. When debris builds on your roof that you don’t clear off, and then the rain comes, water can pool up behind the impromptu dam and lift your shingles or sneak in under your tiles. Without the ability to allow the water to drain as it normally would, it will seep into your roofing material, and can cause some pretty serious water damage. It is best to make sure that your roof is clear of debris, and anything else that may create an unwanted dam, so that you don’t end up with serious water damage inside your home. Although incredibly rare in the Arizona Valley, for those up in the higher elevations that do get winter precipitation, the reality is that ice can be as dangerous on the roof as it is on the streets. Wet snow accumulation gets very heavy, and can cause some serious damage if allowed to accumulate too much. Clearing off your roof of snow after each storm is recommended. When the precipitation is melting off of your roof, icicles can form. Although these can be pretty cool to look at, they are also unstable and can fall, injuring passersby. The same runoff can be held up by an ice dam, creating the same circumstances as the aforementioned debris damming can. During the winter, if you have snow accumulation, make sure to keep your roof cleared of excess amounts of snow and ice, so that you can avoid potential damage to your roof. Scottsdale has a wide spectrum of environmental factors that your home can experience. Proper roof maintenance in Scottsdale, timely re-roofing to preserve the integrity of your roof, and being aware of the elements your roof is being exposed to, all play big parts to keeping your roof functioning properly. 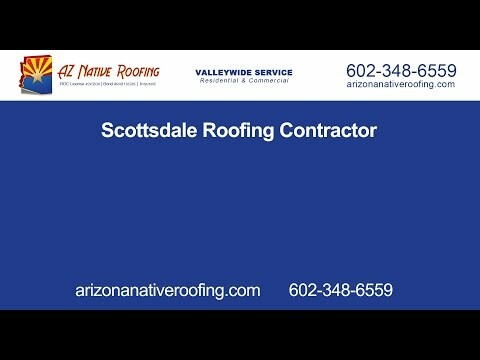 If you have questions about how to best maintain your roof, or need a roofer to assess the health of your roof now, please give AZ Native Roofing a call at 602-348-6559.